This photographs beautifully, let's start there. I've seen it all over Pinterest and had been eyeing it. The neutral colors are perfection! Except it was much different in person than I was expecting. Rather thin, short in the back, and just a bit "meh." So I didn't keep it. Again, I feel like this photographs well, but I really hated it. The body was loose fitting, but the arms super tight. The knit is loose, so it's see through and requires an under layer. I had asked for a warm weather fix, and this would not work for Spring or Summer in Utah at all. I loved this dress! It fit perfect, was actually a good length for a maxi, and the blue & whites stripes were so my style! Unfortunately, It was a bit dressier than I was wanting a maxi to be. I need it to be something I could wear to the park or out to playdates on a daily basis. The fabric just made it a bit too fancy. Plus the neckline wasn't stretchy, making it nearly impossible to nurse in. But ladies... everyone needs this dress!!! I wasn't so sure about this when I pulled it out of the box, but once again, loved it! It has some great length and would actually probably pair better with leggings. It's also super flattering, so that's a big win. However, plaid just doesn't yell Spring & Summer. I knew this would sit in closet for months. Come September, I'm sure I will regret sending this back, but I wanted to free up the closet space for the current months. I love everything about this shirt. 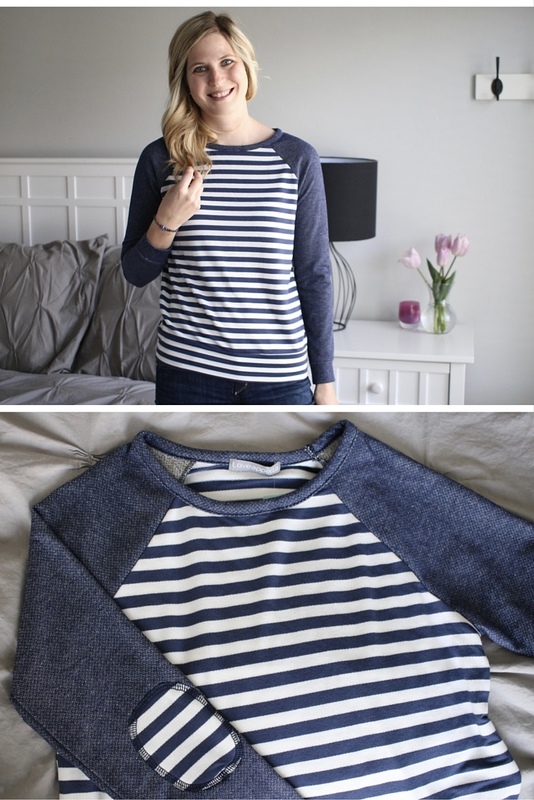 The muted navy colors, the baseball tee style, the elbow patch, the super soft fabric (Loveappella stuff is always super soft)! I will say that the arms are a tad short, but that didn't bother me. I will probably have them slightly scrunched up most of the time anyways. I have worn this way practically nonstop since it arrived! Overall, a pretty darn good fix! Stitch Fix keeps stringing me along. I'm hoping my next fix will involve more summer pieces, because the warm weather is here to stay! If I haven't convinced you to try this service, just once, do it! Finally do it! And use my referral link, because then you are helping my shopping addiction, and you'll get to keep seeing these obviously non-awkward fashion photos! That Loveappella Hannelius Crochet Detail Knit Top looks so pretty on you! I love it!! Those first two pink tops looked gorgeous in you! I have the hardest time pulling off soft baby pinks. The stripes and elbow patches have me swooning! I think I saw you wearing that Loveappella shirt in previous pictures and I loved it!!! All Loveappella stuff that I've gotten is insanely soft (that dress I sent back was the same brand!). I need to pin this and tell my stylist to send it to me next time. Is it super heavy for winter? Or could it transition to spring? Too bad the first two tops didnt' work out well!! I actually love everything they sent you, but it's not practical for nursing. Love that sweater! I LOVE that dress. Too bad the fabric wasn't right and that you couldn't nurse because it looked amazing on you. I definitley love the shirt you chose. So cute and looks comfy. Great fix friend! I really need to get signed up so I can use my gift certificate. I like everything you received, but that elbow patch shirt is perfect! I love it! 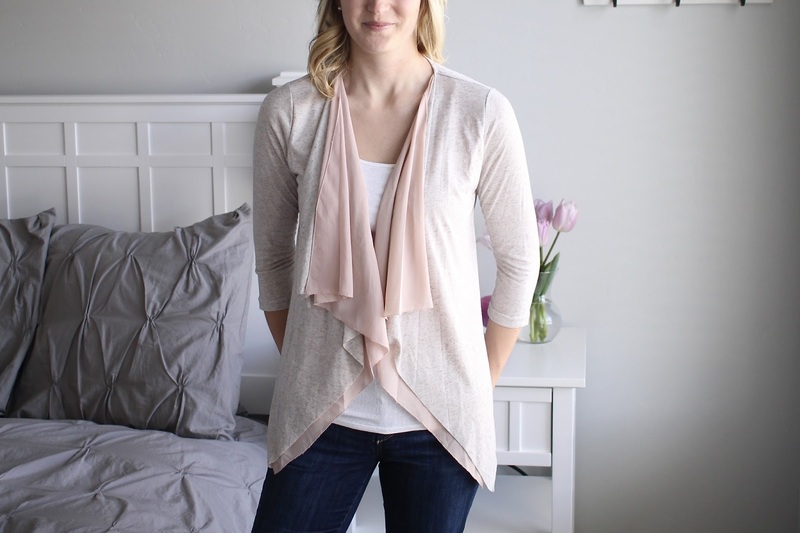 Bummer about that blush cardigan...it's so pretty!!! Love the shirt you kept and I totally want that dress!!!! Are blog posts featuring non-awkward fashion pictures required if I sign up? Because those are in my wheel-house of talents. Aw I think this was a great fix! Totally agree with your choice of what to keep though - I think that striped top just screams you! I love that last top! I almost asked you on IG where you got that when you posted a picture :) Good keep!! I need to start my boxes up again... post-pregnancy I just didn't fit into anything normal. Hopefully the summer boxes will be good! OHMYGOD I need that dress in my life!!! how tall are you?! I am so mad at stitch fix already because i know they won't send it to me if i ask for it, so i'm already mad and i haven't even asked for it. rage. i neeeeed that dress in my life. do you remember how much it was? i hate when things photograph well but are horrible in real life. i feel you! that baseball striped top is fabulous though. Baseball tees are my jam...and this one is so cute!!! Actually, it all looks great on you, but I understand you reasonings for sending all the others back. Glad you found something that would work though!! I agree about the cardigan, it does photograph well and looks great on you. But if you’re not feeling it…you’re just not feeling it. The elbow patch shirt is amazing. I think I might have seen this in one picture you posted previously? If not, it was an elbow patch shirt and I remembered loving it. I would have kept that one, too. Happy Friday sweet lady! Hope you have a good weekend. LOVE that maxi dress; so cute!! Also, love the navy shirt you kept!! I loved them all!! I'm dying for that dress, and those last two tops? YES!!! Pinning the heck out of those right this minute. Yay so glad you got some great ones this time! Everything looks beautiful on you. Loved the ones you chose! I feel like this was a HUGE improvement over your last few fixes. The colors are all so you! Other than the cardigan (which I just didn't love), I think all of them are amazing! 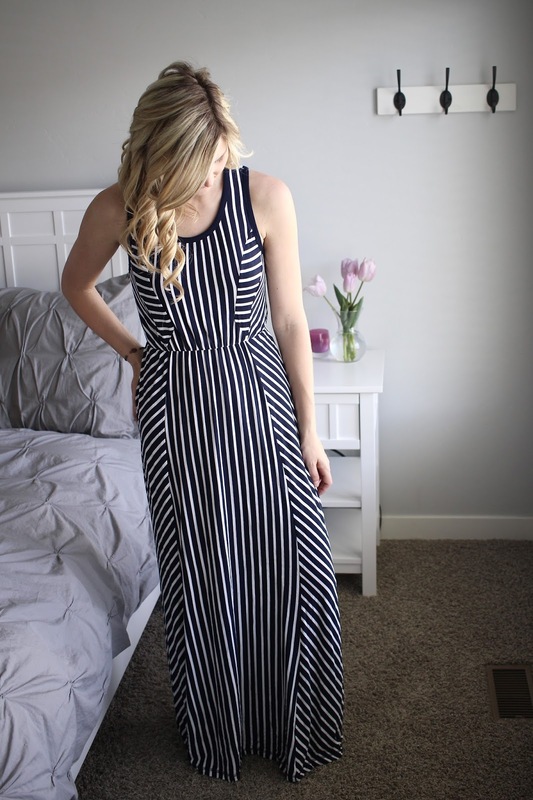 That maxi looks great on you! And I love the detail top! But that top you kept is absolute perfection! I'm so glad they're moving in the right direction again for you! I LOVE the first two tops and I'm surprised you sent them back! ...although I know that things are always different in person than they are in a photo. The top you chose is perfect for everyday wear. Great fix!